On their own, the tech industry’s much-talked about “diversity numbers” don’t say everything about diversity in the industry, but they can indicate, for instance, in which cities women may be more likely to raise money (New York and San Francisco—more on that below). They can also offer insight into a phenomenon that’s mostly invisible. If you want to manage a problem, goes the engineer’s maxim, you have to measure it. Or let’s actually start counting it. That’s the premise behind a simple change on CrunchBase, the popular database for tech companies that’s run by AOL’s TechCrunch: Last week, the database began including the genders of founders and other employees of the thousands of startups it tracks on its profile pages. “We originally wanted to do this for the founders since we wanted to see if the ratio was changing,” CrunchBase’s president, Matt Kaufman, told Fast Company. The NY-based venture capital firm Female Founders Fund (F Cubed) inspired CrunchBase to make the change after it plumbed the data on its own and found an uptick in funding for women-led startups in 2014, especially in New York, when compared to a year earlier. Specifically, F Cubed saw an 1100% year-over-year increase in 2014 for the number of New York women-led startups leading Series A venture capital rounds. In 2013, only one startup with a female CEO raised Series A funding, but that number jumped to 12 startups in 2014. In New York, this kind of investment surged. CrunchBase has not said if they would add an option for users to add ethnicity or race to its people profiles, but Kaufman says he has a “backlog of attributes and metrics” that his team plans to add to the site. CrunchBase users can select one of three options in the “gender” field. Anu Duggal, the founder of F Cubed, said the database could prove a boon to underrepresented entrepreneurs, providing prospective female founders, for instance, with a better understanding of how other women-led businesses fare in funding rounds. That data could help empower female founders to demand as much funding as their male counterparts. “For a lot of my companies, if they’re trying to raise capital, I’ll say, ‘Why don’t you search on this industry and see what are the companies that fall into it, and who are their investors?’ And use that really to figure out who will be your target investors,” says Duggal. The new data could be compared against numbers offered by VCs and companies, and could help clarify evidence like the kind referenced by Newsweek and by Sklar in her blog post. Gender data is not yet available through CrunchBase’s API, but CrunchBase plans to add it soon. Through the API, anyone can access and analyze the large stream of data to look for revealing trends and share it freely. (The database is published under a non-commercial Creative Commons license.) For now, the gender data is limited to CrunchBase’s website. This kind of data sharing is seen as key to compelling more companies to be more open about their workplaces and the challenges they face in recruiting and maintaining a diverse set of employees. CrunchBase’s decision to add gender data was prompted in part by data sleuthing by Duggal and F Cubed’s editorial director, Claire Burke, who began combing CrunchBase’s data on their own, in part as an update to the very statistics that Sklar mentioned in her article. Read the transcript of our chat with Anu Duggal about women and funding here. 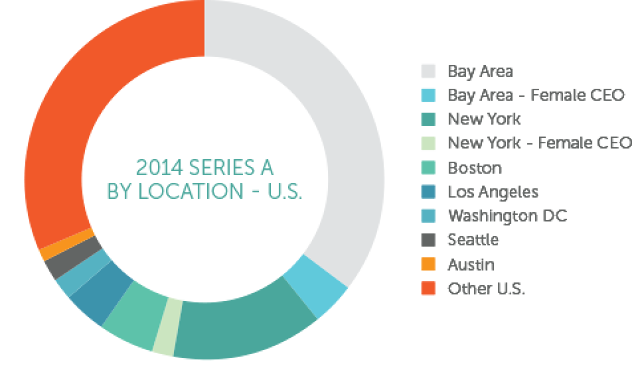 Of the 1,090 U.S. startups that raised Series A rounds in 2014, approximately 10% were founded by women. By state, California and New York stood on equal footing just slightly above the national average, where 12% of companies had at least one female founder. Ohio, Florida, and Maryland led the charge for progress, racking up at least 15 rounds each with over 20% raised by female founders. Texas, on the other hand, sported some pretty disconcerting results—42 startups funded and not a single female founder in the bunch. As Magee notes, the numbers are impressive given that early-stage female founders secured barely 5% of total recorded Series A rounds in 2013, half of this year’s numbers. “It looks like the times are changing, and quickly,” she wrote. In neither case was pulling data on women-led businesses for these graphics easy. Both Duggal and Magee used databases to sort out every business that received Series A funding in 2013 and 2014 in the United States. And both had to deduce each founder’s gender by how masculine or feminine his or first name sounded. Duggal used the filter-heavy database Mattermark for her primary research and then double-checked her data against CrunchBase’s database. And when Magee wasn’t sure about her own gender-guessing skills, she searched for founders’ profile photos. Many of the same diversity statistics are used over and over again, and much of that data is often more than a year old. The same 2013 Babson college statistic was not only used in Newsweek’s story this year but also here, here, and here. A CB Insights report offers similar numbers and continues to be referenced in stories about diversity in Silicon Valley, even though the report was published in 2010. A little over a month after F Cubed published its findings, CrunchBase combed its entire database—it already contains information on financing, advisors, and companies’ and founders’ biographies—and did much of the same tedious work that Duggal and Magee did for their reporting. (Last year, one software developer tried to automate the gender-guessing game on CrunchBase, but the method has its limitations.). The CrunchBase team also added a “gender” field to its people profile pages and has begun to fill in that data for its 360,000 people profiles. Now, anyone who wants to create a data report based on startups and funding by gender can simply reference the gender that CrunchBase explicitly lists on its members’ profile pages. Over the past 10 years, the number of female CEOs leading Fortune 500 companies has grown steadily to 4.8%, according to Catalyst, a nonprofit that seeks to improve gender equality in the workplace. In 1995, no Fortune 500 company had a female executive at its helm. New venture capital firms, like Duggal’s F Cubed, the Cowboy Venture Fund, and Aspect Ventures, are helping to tilt the business world’s leadership imbalance at the grassroots level. Since its inception in 2013, F Cubed has funded 13 female-founded startups. Four of the founders that Duggal has backed have already returned to invest in the fund. And of all of the women-led startups that obtained Series A funding in New York last year, F Cubed invested in three, or 25%. CrunchBase has not said if they would add an option for users to add ethnicity or race to its profiles, but Kaufman says he has a “backlog of attributes and metrics” that his team plans to add to the site. Still, representation of women and minorities in the tech industry remains low. Based on numbers released by over a dozen Silicon Valley companies last year following a barrage of public pressure, the tech workforce is estimated to be about 70% male on average, with board and corporate suite diversity in the single digits. At venture capital firms, only an estimated 6% boast female partners—fewer than they had in 1999. Meanwhile, African-American-founded companies made up about 1% of all venture-backed startups in the U.S. in the first half of 2010, according to CB Insights. Other groups, including Hispanics, received so little funding that numbers were hard to come by for the same period. Screenshot of a people profile on CrunchBase, with the new “gender” field.